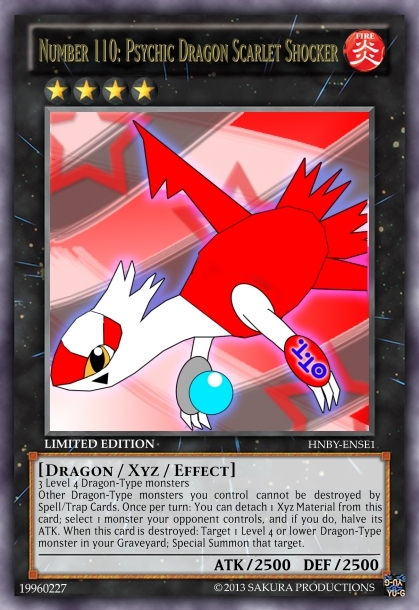 Other Dragon-Type monsters you control cannot be destroyed by Spell/Trap Cards. Once per turn: You can detach 1 Xyz Material from this card; select 1 monster your opponent controls, and if you do, halve its ATK. When this card is destroyed: Target 1 Level 4 or lower Dragon-Type monster in your Graveyard; Special Summon that target. Before anyone points this out, I'll clarify that one point about the picture: Yes, it looks very similar to Latias from Pokemon (and the effect makes a slight note to her signature attack), however it is NOT intended to reference her in any form. I have asked Zextra about this via PM prior to posting this; it's okay since only pic makes any notable reference to her. With the clarification/image stuff aside, this card is supposed to be part of a new Archetype I am currently designing (though this works fine in generic Dragon decks). As for this card's Number, it's Latias's SP ATK or SPD in the games. Same goes for the effect (derived from Mist Ball to an extent). Remember to read the note underneath effect. As usual, reps will be given to those who post good/constructive feedback. Edited by Sakura Haruno, 22 November 2013 - 03:19 AM. Raising this card's stats is manageable. And second of all, the fact the it has to destroy to trigger is great, as most XYZ just get summoned, detach, and blow up/crazy effect. Then you have the afterlife SS which (if used properly) can be used in many other dragon decks, to pull out many tough monsters after you just lost one. But, nevertheless, it is still a fair and well-rounded card. But that aside, yeah it needs to detach to use its Mist Ball effect (that's what her effect was designed after); though halving an ATK permanently is still strong (similar to Gale). You can recycle this card's Xyz Materials when it dies (because in most cases, you'll most likely have used this effect once). Granted, it still takes a bit of time to summon 3 Level 4 Dragons to bring this out; but there are ways of doing it. The artwork is great, and the fact that you drew it makes it even better. I would have not realized the effect was a reference to Mist Ball until you pointed it out. On the effect, I was thinking you could remove the condition of the ATK-halving effect and instead make it an OPT effect. 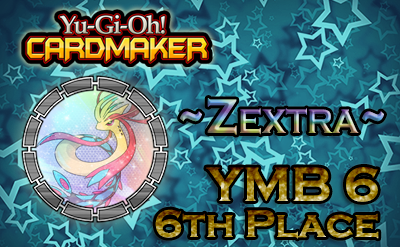 After all, this is a non-generic, 3-Material Xyz so it will be difficult to Summon (outside of its own Deck), and thus I don't believe this effect needs to be further "balanced" by requiring a destruction by battle. Then, as an OPT effect, if your opponent catches this monster with, let's say, Mirror Force or D.Prison, you would have already weakened an opponent's monster. You could even make it a quick effect (during either player's turn). The problem I see with this is that the effect would end quite similar to that of "Ghostrick Dullahan", except that the ATK-halving would be permanent. Given that most monsters have over 2500 ATK to begin with, having the effect as it is may prove difficult to pull off (unless you attack smaller stuff). But yeah, it is good for softening up bigger monsters before it dies and revives one of its Materials and/or some other Dragon. This can work outside of the Archetype I'm designing, though as mentioned in the earlier posts, may prove difficult to do so. P.S. This card's Number is 110 because of Latias's base SP ATK (or speed). Is that so? I thought #110 was her Pokedex Number in the Hoenn Region but I didn't bother with looking it up. I just did, and it's #196; this is just an idea, but you could change her to this number for more flavor (#380, her National Pokedex Number is another option, but it would be high for a Number monster). Plus the series is already on Over-Hundred Numbers and a #110 could be revealed anytime soon, and you will have to change this card's number. The issue with this is that you would have to edit the number on the card's artwork, as well. As for the real one being made, I don't see it happening yet (considering there is only 7 numbers in that series to match up with the users; unless they throw a major plothole at us and bring it some more; or Don Thousand makes some Fake ones). If it does happen though, it'll probably be quite a bit of time after this post. If you remember the last Number card I made (114), I had to put the extra "1" in front due to the existence of Sarameya (a sidenote, I had the idea for 14 a couple months before the real one was even put on the Wikia). I know everyone loves Latias and/or Latios, but thats Pokemon and this is Yu-Gi-Oh! Did you even read the notes underneath the card? This card is IMPLICITLY based on the Eons; not meant to be a reference to them. If you're in here, you're to give some form of comment in regards to its effect/stats/whatever; NOT comment about whether or not the pic looks like a Pokemon. "I deserve a mega evolution, too..."
Read the rules before posting in the forum. Don't post useless spam; it offers nothing of any value to the topic, and is rude/disrespectful. I thought I made that point explicit within the first post of this thread; yes, it is a Pokemon but only by the picture and parts of its effect. Either way, you should be judging on its playability and not because it looks like an anime character (there are a couple other threads in this section that use anime characters in their pics, but they aren't making references to those characters).